People conforms to my head/neck without losing shape during the night. Cool temperature (I do not sweat around neck any longer) is a big plus. Revolutionary cooling memory foam with an infusion of blue gel will help you relax into the most healthful rest imaginable. Regulated temperature and a breathable feel prevent heat build-up, and the contour shape combines both head and neck support to help provide the ultimate in stress relief. I thought this was a "gel foam" type of memory foam because of the "Cool Blue" wording. I was looking for something that didn't create heat as memory foam does. It IS memory foam, rather soft, and actually created more heat than the memory foam pillow I was currently using, maybe because my head sank into it more. It is not what I expected, but that was my mistake as it doesn't actually say "Gel" anywhere in the description. This product was listed as "Firm / Medium Firm" which it absolutely is NOT. If anything, this is on the much softer, squishier side of memory foam pillows that I have tried. I bought this one based on other reviews, and noticed a couple others called out it was soft but I figured I'd take a chance anyway since overall reviews were positive. 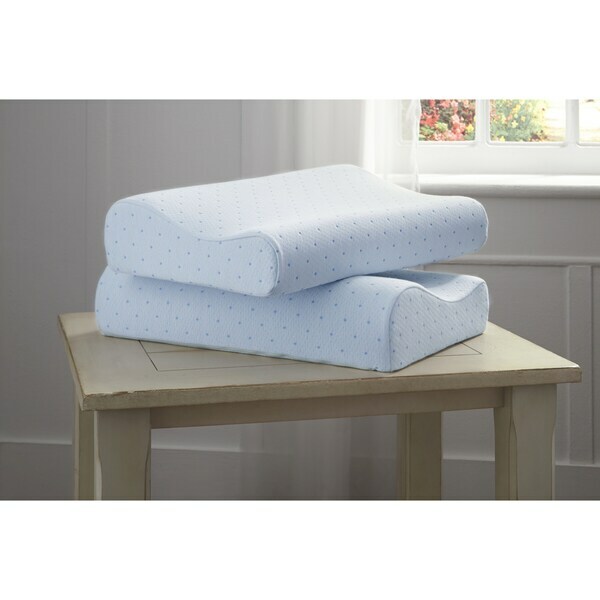 I've used memory foam pillows for years and needed to replace mine, but instead I now have to keep my old one and return this one (which stinks considering the cost of return shipping...) This might work just fine if you like super soft pillows, but if you like them on the firmer side, then definitely steer clear of this one. It's a little softer than expected. The more I sleep on it, the more I like it. Very pleased, would order again. It really is cool for a memory foam. I love my pillow. I bought it for my husband but I use it for myself. It is great support for my neck. I sleep on my side or back. No more waking up with a stiff neck. Very satisfied with the size and the firmness of the contour pillow, and the cool-blue does stay cool all night long. just as good as the much more expensive memory foam pillows...great buy! Unfortunately, this pillow didn't solve my sleep problems as I'd hoped. While the curve does support the neck, it's such a firm pillow that I shifted position during the night and my neck was in more pain than it was before. If you're a sleeper that stays in one position all night, or are used to an extra firm pillow, then this may work well for you. If you're used to a soft pillow, and are looking for one that will actually mold to the contours of your neck, then keep looking. It does support the back nicely, though, if you want to sit up in bed. Overstock will not accept a return on this item which is very hard and uncomfortable, and which a person would not know until one use. I highly recommend purchasing your memory foam products in person and not from this site. I have used overstock a lot, and this was indeed a major disappointment to say the least. great product, exactly as advertised. Very thin, goes completely flat within seconds on it. good support for neck problems. These were softer than what I was used to but really like them and no sore neck in the morning. The pillow is very soft, comfortable and supportive. I sleep both on my back and side and I really like this pillow. It does not get hot either. I have been using this pillow for a couple months now and I really have no major complaints. It was MUCH lighter than my old Tempur-Pedic pillow, but that one was hot as heck. It would make my earlobes sweat! So, I'm over the weight issue. It's a good pillow. Nothing spectacular, but I'm not even sure what a spectacular pillow would be. I like it and I recommend it. I just got them they seem ok. I would recommend this pillow. It kept its shape, and did not add heat to my head or neck. The bargain of my month!! It was good to toss my old pillow away, after a comfy sleep on this pillow. My fiancée loves his new pillow, and I do as well! I really enjoy the curve of this pillow, it really helps relieve morning neck pain. It is much lighter than I expected. A little more weight to the follow would be nice. Overall, I would definitely buy this again. Very cool and comfortable on the neck and head. A great value. This is our second set of these pillows. Pretty good for the price. I have a lot of upper back and neck pain. When I adjust myself just right on this pillow it is very comfortable. This is usually on my back but tossing and turning at night makes it not so comfortable, what could one expect. I like using this to give me relief sometimes. works great, has held it's shape very well. my husband loves it.